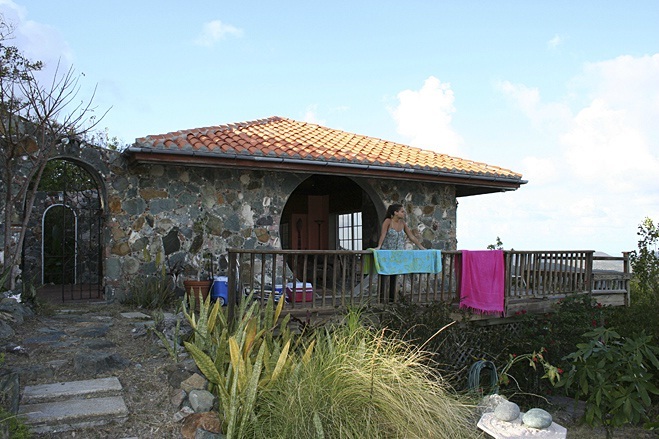 Now really, you can go online and search for St John Virgin Island Getaways and come up with a host of offers and deals. There certainly are no shortage when it comes to Virgin Island Vacations and the agencies who offer them. But let’s think about what a true romantic St John Virgin Island vacation should be. Do you really want to be in the middle of the hub bub, or are you looking for peace, tranquility, relaxation and the most splendid views on the islands? Honeymoons, anniversaries, birthdays…or just the most incredibly romantic vacation you’ve ever spent could be right here with us at Castle St John. We have been providing beautiful vacation rentals to guests for many years and our expertise in the area will be useful to you. Traveling here can be a bit different and we do have some important tips posted on our FAQ page. Please read and be prepared for some of the situations you may encounter on the islands. Two very separate bedrooms, king and queen, each with adjoining full baths. Besides the fully-equipped, modern kitchen and mahogany great room, there is a tiled outdoor shower, expansive decks and balconies, an observatory sundeck with giant chess on the fifth level, and a whirlpool spa nestled in a tropical garden. There is a gas outdoor grill, CD and cassette stereos, cable TV in the bedroom and the living room, DVD and VCR, beach towels and chairs, as well as native drums, a hammock, a telescope and Wi-Fi throughout the house. Ceilings, furniture, and cabinetry are custom made of cyprus and mahoganies with a feeling of casual elegance. Artistic refinement… lovingly created over eight years by the designers… relics in the walls… fine mosaics… sculptures and a Japanese Zen garden and a grey water system for watering the new gardens. This unusual decor is accented by local paintings, masks, crafts, and statuary. We look forward to meeting you and providing you with the most memorable romantic Virgin Island vacation possible.